The communications team at Helsinki City Museum will be happy to help you with any inquiries concerning the Burgher’s House Museum! Use the STT Info service to subscribe to press releases (in Finnish). To subscribe to Burgher’s House Museum’s press releases, type “Helsingin kaupunki, kulttuurin ja vapaa-ajan toimiala” (City of Helsinki, culture and leisure section) under “Julkaisija” (Publisher). Slip in through the yellow gate and get acquainted with the life of the middle-class in the 1860s Helsinki. The Burgher’s House was completed in 1818. It is the oldest remaining wooden house in central Helsinki. Head Fireman Alexander Wickholm bought the house in 1859 as his home with his wife Erika and their three children. The rooms of the house have been restored and decorated according to information obtained from estate inventories to illustrate the life of a wealthy minor official’s family. 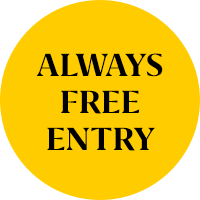 Entry is always free to the Burgher’s House Museum! Burgher’s House Museum is a part of Helsinki City Museum. The same organisation also includes the Hakasalmi Villa, the Worker Housing Museum and the Tram Museum.